Multiple scenes of Sherman County, Kansas. In the baseball photograph, pictured are: Moorehead, pitcher; Mahoney, catcher; Germann, 1st base; Russell, 2nd base; Ingram, right field; George West, umpire; and Bill Wright of Smith Center, batting. 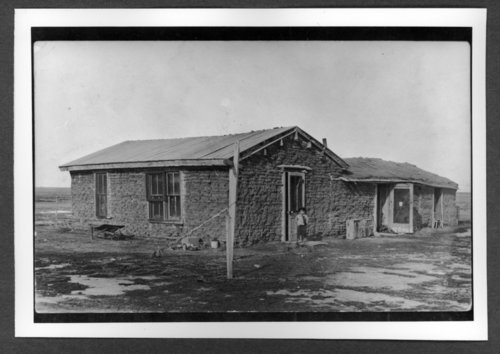 Scenes of Sherman County, Kansas - Mercer sod house with Jesse "Jay" Mercer.